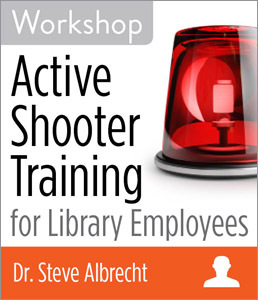 CHICAGO—ALA Publishing eLearning Solutions announces a new workshop, Active Shooter Training for Library Employees with Dr. Steve Albrecht. This workshop will last 90 minutes and take place at 2:30pm Eastern/1:30 Central/12:30 Mountain/11:30am Pacific on Wednesday, April 3, 2019. Cases of workplace violence involving armed perpetrators at libraries are both rare and catastrophic. Not all subjects have used guns in these attacks; edged weapons are a concern as well. Recent attacks in Sacramento, CA; Framingham, MA; and Clovis, NM have heightened the awareness of the need for library employees to follow the national Department of Homeland Security (DHS) protocol: Run - Hide - Fight. Since all employees are in charge of their own sense of security, they need to know what to do, what not to do, and how to protect themselves and others during these life-changing events. When to use “high-risk customer service skills"